Flaming Prawn Goby, Ultimate Nano Fish? If you've never heard of the Flaming Prawn Goby, or Griessinger's Goby as it is also known (Discordipinna griessingeri), its understandable. At less than 1 inch long, they are often overlooked, many retailers simply overlook this tiny fish when picking out or ordering new livestock. And due to the their small size, it is usually very difficult to display this fish without somehow losing it down the overflow or some other mystery loss. Add to that the exhorbitant price that these fish commanded for a long time, making it ounce for ounce one of the most expensive fishes available, often times selling for $170 or more dollars for a 3/4inch fish that would be lost in most displays. With all of these factors stacked against it, it would seem this fish certainly should not earn the title of "Ultimate Nano Fish," Right? But first, how would one Qualify the "Ultimate Nano Fish"? Well obviously it must be small in order to be suitable to the wide variety of "Nano" tanks that are so popular tod ay. I have a 24 gallon display set up in the store, and it is one of the most popular attractions! What other credentials should the "Ultimate Nano Fish" have? It definitely must be attractive looking, have an interesting "personality", and should not be too expensive. Many interesting fish are definitely in the running for "Ultimate Nano Fish" and many of them are probably from the Goby family, Gobiidae, which is one of the largest of all fish families, encompassing more than 2,000 species with more being discovered regularly. 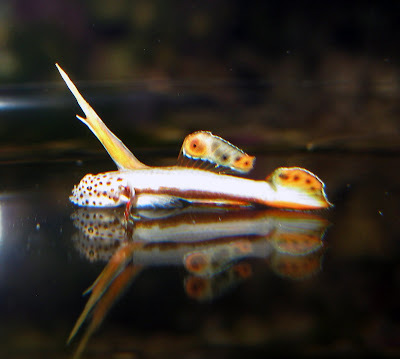 So it's no surprise how many Gobies end up in the Aquarium trade, and the fact that most are fairly small, very hearty fish, with unique behaviors makes them even more appealing! Consider the Shrimp gobies, whose unique relationship with pistol shrimp is a favorite of marine aquarist, or clown gobies, who have an affinity for hosting in all types of coral heads, or even the cryptic Circus Gobies (Priolepsis nocturna), which are very shy but interesting nonetheless as they hang upside down to rockwork. But if I had to choose one, I would probably choose the Flaming Prawn. On closer inspection, one realizes its a very beautiful fish, one of the most dramatically colored fish available. With large "Flaming" orange pectoral, dorsal, and tail fins, offset by a stark white backround and a polka dot face, whats not to love about the way this little fish looks? As for size, these tiny fish are definitely suitable for all but the smallest pico tanks. I would recommend at least a mature 12 gallon or larger to be sure there are plenty of copepods and other micro-crustaceans for them to prey on. I constantly see mine picking through the crushed coral sandbed in my 24g. Its even been suggested that they pair with with pistol shrimps, but I have not witnessed that and I added a Candy stripe pistol (Alpheus randallii) at the same time. So that just about covers all of the caveats of "Ultimate Nano Fish", but what about price? Well with recent advances in collection and handling techniques, as well as more demand, the price has dropped dramatically. It is not uncommon for us to sell the fish for $60-75 Dollars depending on the time of year and availability. That still makes it one of the more expensive nano fish, but its a lot cheaper than it used to be, thats less than their former wholesale cost!! However this cannot be guaranteed forever. All we need now is a few pioneering aquarists to Aquaculture this fish!! So what are my recommendations for this fish? Well first you'll want to make sure its in a fairly comfortable environment to witness more natural behaviors. This means giving it room to hide, as well as keeping larger more aggressive fish that would frighten it out. I house mine in a 24g Aquapod with 2 ORA Stubby Clownfish, a small Cherub Angel, and a few other small gobies including Circus, Clown, Eviota, and Trimma gobies, as well as a bluestripe pipefish. A rich and mature system will help you acclimate this fish and ensure it has plenty of food to prey on. So your convinced, and want one for your tank but not sure how to get it? Any reputable LFS should have access to this fish, however it still may be hard to track down. Many store owners and wholesalers are still unaware of this fish. If your having a hard time finding a "Flaming Prawn Goby" feel free to contact us! You can call us at (951)727-8332 or send an E-mail to Sales@themysticreef.com or themysticreef@hotmail.com. I'd love to hear anyone's Questions, Comments, Or your suggestion for "Ultimate Nano Fish!"